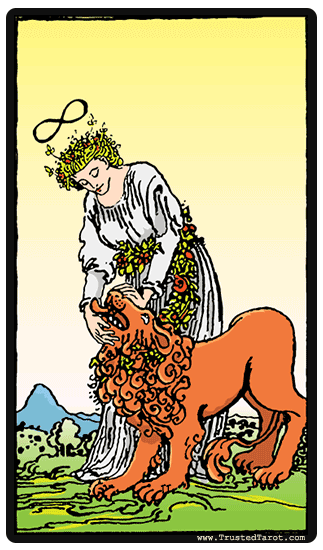 In this tarot card, you will see a woman who calmly holds the jaws of a fully grown lion. Despite the fact that the lion looks menacing and strong, the woman seems to have dominion over it. What is captivating is how gracefully she controls the lion. She is calm and collected, which is representative for being in control and disciplined especially in times of great adversities. The fact that she is also holding the jaws of a lion also shows that she has courage. Her control of the lion without being too rough shows love and compassion. The blue background over the mountains shows stability and the kind of calmness that comes with being stable. The lion is a symbol of courage, passion and desire which are very much part of the human feelings that are necessary for survival. But if these feelings are not put in check can lead to our eventual destruction. When you get the Strength card in an upright manner during your tarot reading, then it shows that you have inner strength and fortitude during moments of danger and distress. It shows that you have the ability to remain calm and strong even when your life is going through immense struggle. It also shows that you are a compassionate person and you always have time for other people even if it's at your own expense. Your resilience will greatly aid you, and your fearlessness means that you should have no issues speaking your mind. Getting the strength card means that you are a very patient individual who is likely to accomplish anything that they put their mind to. Your resilience will greatly aid you, and your fearlessness means that you should have no issues speaking your mind. This card also indicates this kind of compassion will always be rewarded with having a lot of stability in your life either presently on in the near future. An upside down Strength card can mean that you are (or about to) experience an intense anger or fear in your life. You seem to be lacking the inner strength that this card normally represents, meaning you might be experiencing fear, and a lack of conviction and confidence in your own abilities. This can mean that you have forgotten all about your passions and the kind of joy, happiness, and fulfillment that came with doing what you love. A reversed strength card in a reading might also mean that one is experiencing depression because of a number of reasons and because of that, it is draining all of the happiness from their lives. One might end up being withdrawn from society because of the unhappiness or depression since they may feel people are the reason why they are so sad. It can also be a sign of jealousy, especially when everyone seems to be happy or excelling in every aspect of life while you are stagnating. This card indicates that you must learn to gain confidence in order to re-harness your inner strength.